— 9:30 a.m. (10:30 a.m.) Visit to a home for the aged run by the Missionaries of Charity. — 10:30 a.m. (11:30 a.m.) Meeting with clergy, religious men and women, and seminarians at the El Quinche National Marian Shrine. Speech by pope. — Noon. (1 p.m.) Departure by airplane from Quito to La Paz, Bolivia. — 4:15 p.m. Arrival at El Alto International Airport in La Paz. Arrival ceremony. Speech by pope. — 6 p.m. Courtesy visit to President Evo Morales in the Palace of Government. — 7 p.m. Meeting with civil authorities in the La Paz cathedral. Speech by pope. — 8 p.m. Departure by airplane for Santa Cruz. — 9:15 p.m. Arrival at the Viru Viru International Airport in Santa Cruz. Quito local time: 09.30-Pope Francis visits a Home for the Aged, run by the Missionaries of Charity in Quito, in the course of his apostolic visit to Ecuador. Quito local time: 10.20-Pope Francis meets Clergy, Men and Women Religious and Seminarians at the "El Quinche" National Marian Shrine, in Quito. On the final day of his Apostolic Visit to Ecuador, Pope Francis made a brief stop at a home for the elderly run by the Missionaries of Charity in Quito. Thousands lined up the streets surrounded the residence to catch a glimpse of the Pope, many of them shouting "Queremos ver al Papa" (We want to see the Pope). Upon his arrival, the Pope was welcomed by the sisters. The nuns laid a wreath of blue and white flowers around his neck and accompanied him to the chapel where he remained in silent prayer for several minutes. He was then led to a room where the elderly residents received him with cheers. One of them welcomed the Holy Father and placed a traditional hat on the Pope's head. The 78 year old Pontiff then greeted each resident one by one. 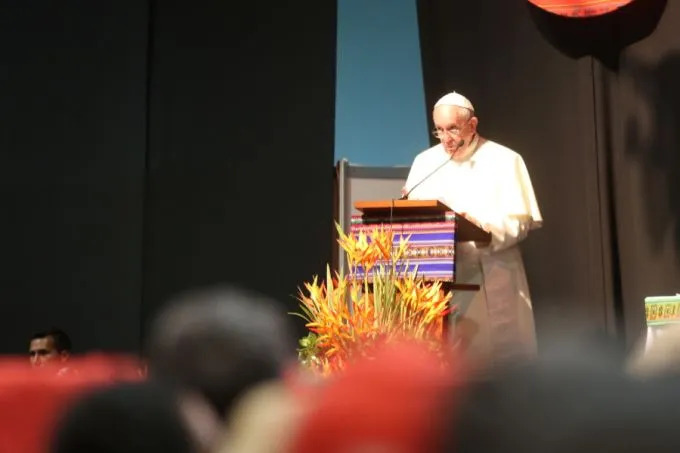 (Vatican Radio) At the National Marian Shrine of El Quinche, Pope Francis met with clergy, men and women religious, and seminarians, for the final event in his trip to Ecuador. The Holy Father did not deliver his prepared remarks, choosing instead to speak off-the-cuff - and from the heart - to those who had gathered at the Shrine. His prepared text focused on their call and their mission; on perseverance in that mission; an on joyful evangelization. The Pope also called on the clergy, religious, and seminarians to care for, encourage, and guide popular devotions. Video shows "Please stand by. Starting soon..."
La Paz local time, Wednesday 8 July 6.40 pm - Pope Francis pays a courtesy visit to the President of the Plurinational State of Bolivia, and later meets the Civil Authorities in the Cathedral. La Paz, Bolivia, Jul 8, 2015 / 04:19 pm (CNA/EWTN News).- Arriving in Bolivia on Wednesday afternoon, Pope Francis greeted those waiting for him with the greeting “jallalla,” significant because it comes from the Quechua-Aymara languages of the nation's indigenous peoples. Francis used the phrase “Jallalla Bolivia” at the close of his July 8 speech of greeting to Bolivians at the airport of La Paz, the nation's administrative capital. In his address, the Pope noted the country’s rich cultural and ethnic diversity – it has 36 official languages beside Spanish, the largest of which is Quechua. He said he comes as a pilgrim to renew the country’s faith, and he also encouraged further social, economic, and political development. Following the welcome ceremony, the Holy Father visited privately with Bolivia’s president, Evo Morales, before meeting in La Paz cathedral with Bolivian civil authorities and representatives of culture and civil society. In his prepared remarks, Pope Francis focused once again on the need to work in concert to promote the common good and meet the challenges facing society, especially the crisis of the family, immigration, and integral human development alongside and together with the challenges of stewardship of creation. — 10 a.m. Mass in Christ the Redeemer Square. Homily by pope. — 4 p.m. Meeting with priests, religious men and women, and seminarians in the Don Bosco school. Speech by pope. — 5:30 p.m. Participation in the second World Meeting of Popular Movements at the exposition grounds. Speech by pope. “I stopped by to greet you and above all to commemorate a brother of ours, who became a victim of certain interests who did not want him to fight for Bolivia’s freedom. Fr. Espinal preached the Gospel and this bothered people. 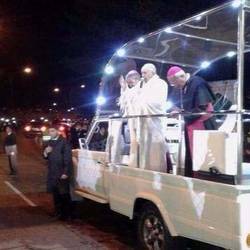 So they got rid of him.” Darkness has fallen and Pope Francis had the Popemobile stop and made a scheduled stop between El Alto airport and the Bolivian capital La Paz. The spot along the road towards Chacaltaya where the dead body of Fr. Luis Espinal - a.k.a. Lucho, a Spanish Jesuit, poet, journalist and film-maker (he had specialised in cinema and television at the Catholic University of Milan) who had been a missionary in Bolivia since 1968 - was dumped on 22 March 1980. The "communist crucifix" was presented to Pope Francis on Wednesday. Bolivian president Evo Morales presents Pope Francis with a 'communist crucifix' at the presidential palace in La Paz, July 8, 2015. Credit: L'Osservatore Romano. 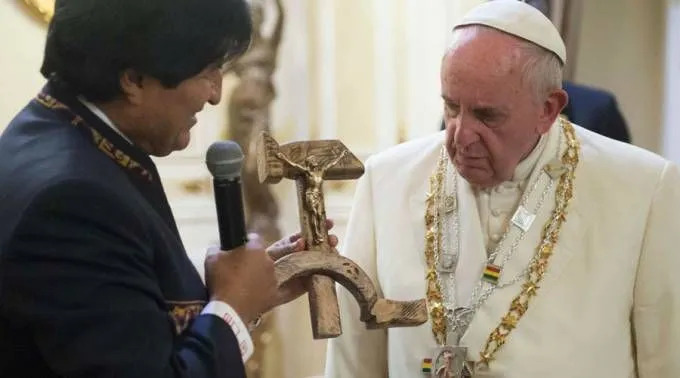 La Paz, Bolivia, Jul 9, 2015 / 10:45 am (CNA/EWTN News).- When leftist Bolivian president Evo Morales on Thursday presented Pope Francis with a “communist crucifix” – a carving of Christ crucified on the hammer of a hammer and sickle – the Pope's only reaction was to say, “This is not ok,” while shaking his head. Shortly after his July 8 arrival at the Bolivian administrative capital of La Paz, Pope Francis made a courtesy visit to Morales at the Palace of Government. At such meetings, the leaders customarily exchange gifts; Pope Francis gave the Bolivian president a mosaic of the Marian icon of the “Salus Populus Romani,” her role as patroness of Rome. Morales explained what his gift to the Pope was as he gave it to him. In the video, filmed by the Vatican Television Center and transmitted throughout the world, the Pope's disapproval of the gift can be seen, and he says “No está bien eso” – “This is not ok” – while shaking his head. While the audio is a bit marred by the clicking of journalists' cameras, the embarrassment of the Pope seems clear. At a July 9 press briefing the Holy See press officer, Fr. Federico Lombardi, noted the lack of clarity in the audio of the exchange, and remarked that Pope Francis had been unaware the crucifix was a replica of Fr. Espinal's. Morales' gift has sparked a worldwide controversy, and reactions were not long in coming. The majority of them accuse Morales of trying to politicize the Pope's visit. 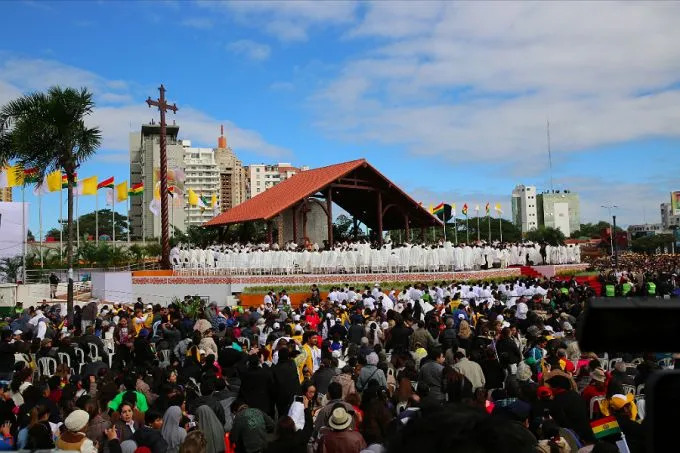 Pope Francis says Mass at Christ the Redeemer Square in Santa Cruz de la Sierra, Bolivia, July 9, 2015. Credit: Alan Holdren/CNA. Santa Cruz de la Sierra, Bolivia, Jul 9, 2015 / 08:55 am (CNA/EWTN News).- Giving into despair when confronted with life’s difficulties only leads to an individualistic attitude that discards others, Pope Francis said Thursday, explaining that with Jesus, no one is ever left out or excluded. “A despairing heart finds it easy to succumb to a way of thinking which is becoming ever more widespread in our world. It is a mentality in which everything has a price, everything can be bought, everything is negotiable,” the Pope said July 9 during his homily at his Mass, said in Santa Cruz de la Sierra's Christ the Redeemer Square. He said that thinking this way only leaves space for a select few, while the rest – who “don’t add up” or are considered unsuitable and unworthy – are discarded. Santa Cruz de la Sierra Local Time: 17.20- Pope Francis participates at the II World Encounter of Popular Movements, with Delegates of worker movements of occasional workers, migrants, aboriginals, landless farmers. (Vatican Radio) Pope Francis met with clergy, religious men and women, and seminarians on Thursday afternoon in Santa Cruz, Bolivia. Below, please find the full text of the Holy Father’s prepared remarks, in their official English translation. I am pleased to be able to meet you and to share the joy which fills the heart and the entire life of the missionary disciples of Jesus. This joy was expressed in the words of welcome offered by Bishop Roberto Bordi, and by the testimonies of Father Miguel, Sister Gabriela, and by Damián, our seminarian. I thank each of you for sharing your own experience of vocation. “I say this to you with regret: many grave sins were committed against the native peoples of America in the name of God,” he said July 9. The Pope’s comments came during an address to the World Meeting of Popular Movements in Bolivia. Francis is currently in the middle of a July 5-13 trip through Latin America, which began in Ecuador and will continue in Paraguay. Here is a Vatican translation of the address Pope Francis gave this afternoon in Boliva at the 2nd World Meeting of Popular Movements. He followed the text nearly word for word. (Vatican Radio) Pope Francis spoke Thursday evening at the World Meeting of Popular Movements, taking place in Santa Cruz, Bolivia. The World Meeting of Popular Movements, organized in collaboration with Pontifical Council for Justice and Peace and the Pontifical Academy of Social Sciences, brings together delegates from popular movements from around the world.